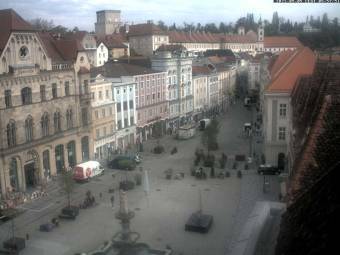 It's 07:54 in Steyr, Austria right now. The Steyrer WebCam The webcam, located on the roof of the town hall, faces the 'Stadtplatz' in direction of the 'Enge Gasse'. Reichraming: Town View, 10.5 miles away. Seitenstetten: Airfield Seitenstetten - LOLT, 10.8 miles away. Maria Neustift: View from the Glasenberg, 11.2 miles away. St. Florian (Linz-Land): A1, ahead of Knoten Linz, 11.6 miles away. Ansfelden: A1, at Knoten Linz, 13.1 miles away. Kremsmünster: Panorama over Kremsmünster, 13.4 miles away. Maisdorf: A09, bei Parkplatz Maisdorf Ost, Blickrichtung Wels - Km 12,64, 16.5 miles away.